Quod Graecorum Ithaco concio iniqua dedit. Quae boat, & tali voce sepulchra ferit. Affectus fas est cedere iustitiae. The shield of Aeacus’ descendant, stained with Hector’s blood, the unjust assembly of the Greeks awarded to the Ithacan. Neptune, showing more respect for equity, seized upon it when it was cast into the sea in the shipwreck, so that it could go to its proper master. For the wave carried it to Ajax’s tomb upon the shore, the wave which booms and smites the sepulchre with these words: ‘Son of Telamon, you have conquered. You are more worthy of these arms’. It is right for partiality to yield to justice. Gerechtigkeyt sigt doch zu letsten. Neptunus sagt, wie ist das gspilt? Lont man also dem gueten knecht? Doch finndt sich dwarheyt mit der zeit. 1. This is a version of Anthologia graeca 9.115-6. See Homer, Odyssey 11.541ff. for the contest for ownership of the divine armour of the dead Achilles (i.e. 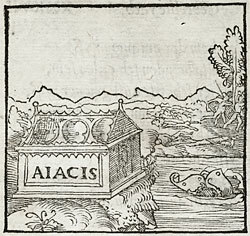 Aeacus’ descendant), who had earlier killed Hector. The Greek assembly awarded the armour to smooth Odysseus (the Ithacan) rather than to brave Ajax (son of Telamon), and, according to later tradition, Ajax became mad with fury and humiliation. Returning to sanity he committed suicide in shame. See e.g. 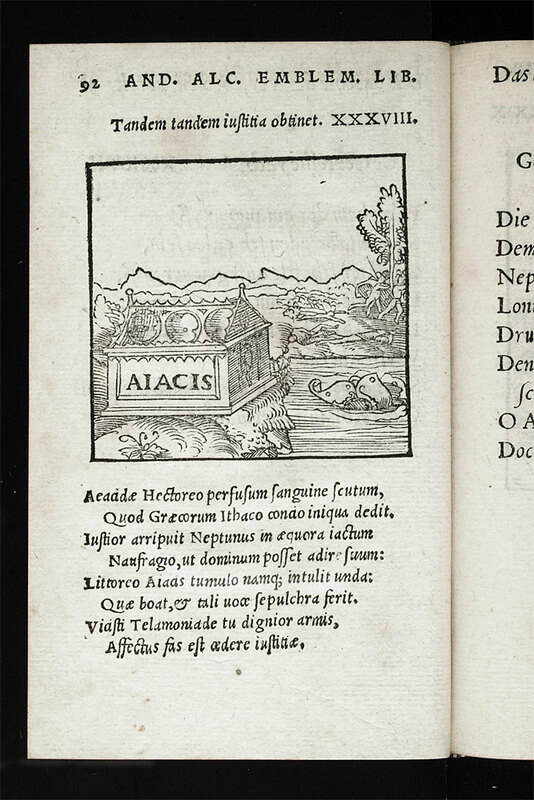 Ovid, Metamorphoses 13.1.ff; and [A50a175]. Ajax was buried on a promontory near Rhoeteion, not far from Troy.